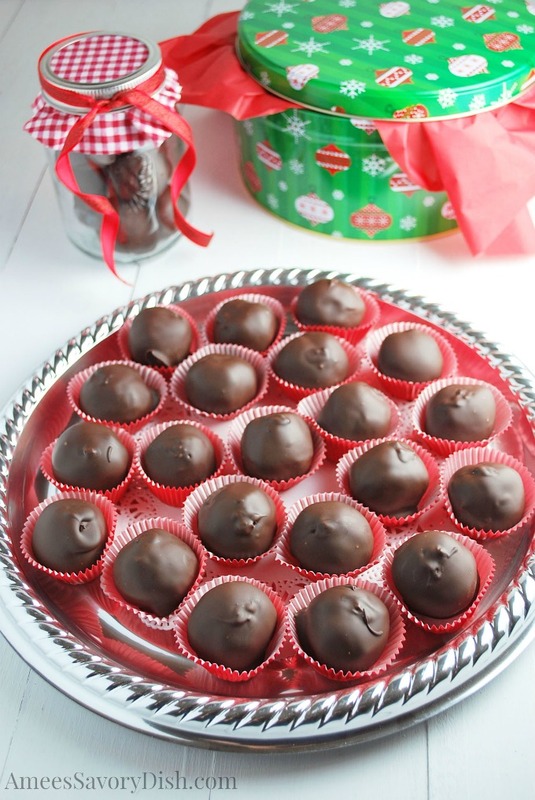 These Boozy Bourbon Balls are also fondly known as “Kentucky Kernels” for the generous amount of Kentucky bourbon used in the recipe. It’s probably been about ten years now since I first tasted one of these decadent confections. I can seriously only eat half of one of these before I feel a sugar rush (I don’t eat sweets very often, so my body is like “WTF” when I do). My mother-in-law’s friend, Ethel, brought them to Christmas dinner with my husband’s family. Instead of her having to spend the holiday alone, she was invited to join us for Christmas. She was a hoot, ya’ll! She has since passed away, so every time I pull out her handwritten recipe for these boozy balls I think about Ethel. She told me that she would soak her nuts for weeks, so they’d be extra drunk for the recipe. I mean, who doesn’t like drunk balls?? These are really easy, just give the nuts at least a couple of days to soak (or like Ethel said, a few weeks) and allow them to harden overnight in the fridge before dipping in chocolate. They need to be really cold to keep them from falling off the toothpick when you dip. Boozy Bourbon Balls "aka Kentucky Kernels"
Place chopped nuts in a mason jar or similiar sealed container and add just enough bourbon to completely cover nuts. Drain nuts, saving the bourbon. In a large mixing bowl, beat butter and powdered sugar until blended. Add nuts and just enough bourbon to get the best consistency for rolling into balls. Scoop out mixture with a tablespoon and roll into balls. Cover with plastic wrap and refrigerate until firm. 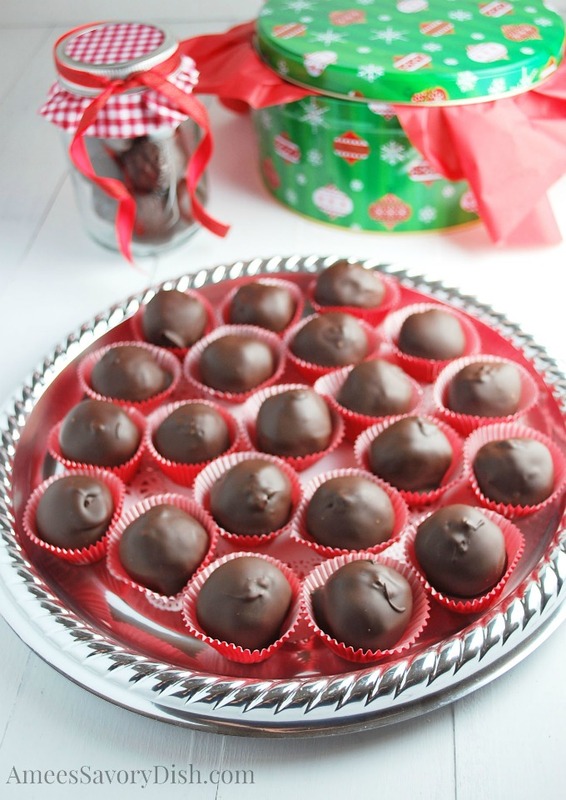 Dip balls into chocolate, covering all sides, using a skewer and place onto wax paper to cool. Store balls in the refrigerator until ready to serve. Don’t miss your chance to win one of these great prizes!! Tomorrow is the last day to enter and this one is too good to miss!! Oh my, I bet these are very flavorful. Thanks for the trip down memory lane, Amee. Ethel was a unique and very talented person. Re-reading the recipe inspired me to get out the bourbon and start soaking the pecans!! I’m glad you enjoyed the post! I loved Ethel, she was so funny! My favorite sweet treat to makee is divinity. My Mom made the best, I aam not even close, but it reminds me off her so I continue making it. I have had these drunken balls in various forms and they are so good!!! Welsh cakes are my favorite holiday treat to bake. 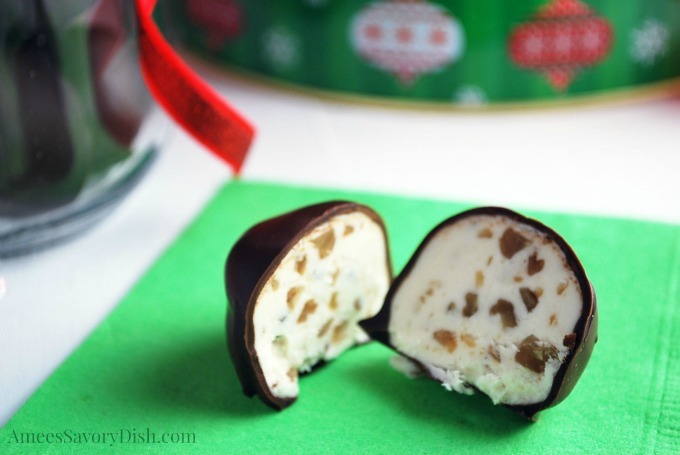 The holiday dessert that takes me back to my childhood are the chocolate-coconut-marshmallow-walnut kind of stainglass window cookies. I love Christmas cookies. Simple, you can have a variety, love them. I usually make a nice chocolate cheesecake. How far in advance can I make the bourbon balls. Entertaining a party of 200 and must make several days in advance. They keep for a few weeks in a sealed container in the refrigerator, so you should be fine. I hope they’re a big hit! Lol,I feel ya! It can be time consuming. The soft filling almost needs the hard coating, but if you try them as bars, just be sure and chill them prior to cutting and use a really sharp knife to slice. Let me know how they turn out!